Double Yellow-Headed Amazons are excellent talkers and frequently sing very well too! The Double Yellow-headed Amazon Amazona oratrix, is an extremely intelligent, attractive and entertaining parrot. Also known as the Yellow-headed Amazon and Yellow-headed Parrot, this is a prize bird that is particularly handsome with a high aptitude for speaking. While young these mostly green birds have only a yellow forehead and maybe a dappling of yellow across the rest of the head. The completely yellow head of mature birds takes place through molting over a period of about 4 years. The adult is a lively, spectacular colored pet bird. The Yellow-headed Amazon has been popular as a pet for several 100 years. These birds are very inquisitive. They are definitely not a timid or shy bird and are known to be drama queens/kings. The Double Yellow Headed Amazon will usually attach itself to one member of the family as a mate but will tolerate the other members of the family as part of the flock. Similar to other Amazons they are very sociable and active, but with them it's to an unusual degree. Depending on the individual bird, Double Yellow-headed Amazons can have an incredible vocabulary. They are considered the best talkers of all the Amazon birds, and second only to the African Grey Parrots. These parrots also strongly desire the attention of their owners, and will perform all sorts of amusing antics to gain and keep it. Such things as fanning out their tails, quick wild head movements, turning their head upside down, and rapid in-out dilations of their pupils. This particular amazon can be feisty. Early socialization and training will help alleviate that to a great degree. The Yellow-headed Amazon is very social on the one hand, enjoying its human companion and their company. Yet on the other hand it can be quite independent, needing and wanting alone time and its own territory. A human needs to understand their birds' body language. If they are not in the mood for company or interaction, they will let you know. . Learn when its head is down and its beak and wings are in position, that it means "NO", and if you are persistent you might get nipped. The Yellow-headed Amazon is also prone to a hormonal stage as it matures, which is why they are recommended for an experienced bird owner. With the Double Yellow Head you get the best of both worlds. A parrot that will enjoy the interaction with its human, eating and playing or even watching television. Yet it can also entertain itself without being demanding, content just playing with its toys, for hours at a time. More recently the birds in the ochrocephala group have been under review, with some classification adjustments being made. In in 1991, a recommendation to reclassify this group was made by the Committee on Classification and Nomenclature of the American Ornithologists' Union. This has resulted in the Amazona ochrocephela now being identified as the Yellow-crowned Amazon only. The Yellow-naped Amazon is now described as Amazona auropalliata, and the Yellow-headed Amazon is now Amazona Oratrix. The Double Yellow-headed Amazon Amazona oratrix was first described by Ridgway in 1887. It is also known as the Yellow-headed Amazon and Yellow-headed Parrot. It is native to central and northwestern areas of Central America, the coastal regions of Mexico. In the wild they live in pairs or flocks, and are sometimes seen singly. They inhabit forests, savannahs along the forest edge, and wooded areas where they feed on fruits, seeds, nuts, berries, and the blossoms and leafy buds of foliage. This subspecies from the Islas MarÃ­as is more colorful. Its color shows a brilliant yellow which extends onto its chest and intermittently down to the start of the tail. It has a vivid red on the bend of the wing and is also missing the black barring on the shoulders. This subspecies is found widespread in coastal Belize. This Yellow-headed Amazon, is yellow only on the upper head to a line from lores to earspot, including the upper cheeks. This subspecies is found in the Sula Valley, Honduras. Its yellow coloration is only on the fore head and the nape. 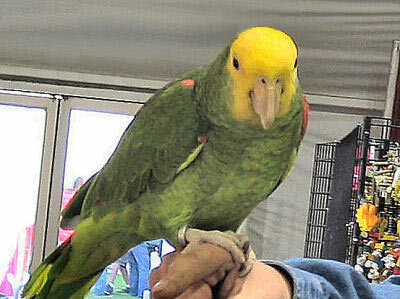 Another race, the Magna Yellow-headed Amazon A. oratrix Magna, is from the Gulf slope of Mexico. It is not a recognized subspecies. Say it is smaller and the variations in color areÂ a result of location. It looks identical to the nominate species as a juvenile, and does have the black barring on the shoulders as an adult. The guatemalensis s found in north-western Honduras and adjacent eastern Guatemala It is also not a recognized subspecies, but resembles the Belize Amazon A. oratrix belizensi so is commonly included in the subspecies. It may be an undescribed subspecies. The Amazona oratrix is on the IUCN Red List for Endangered Species as Endangered (EN). The Double Yellow-headed Amazon is generally green with paler, more yellowish on the under parts. The entire head and throat are yellow and the bend of the wing is red with some yellow mixed in. The carpal edge and thighs are yellow. The ring around the eye is unfeathered and white. The iris of the eye is orange and the beak is horned colored turning gray towards the base on the upper mandible. Yellow-headed Amazons are surprisingly heavy bodied. Mature birds are a bit larger than other Yellow-crowned Amazons , these Amazons reach 15 -17 inches (38- 43 cm) long from the head to the tip of the tail. Maturity is considered in the 4 - 5 year range and the life span for these creatures is 60 - 80 years. Lutino and blue variations of the Yellow-headed Amazon have been produced in aviculture as well as a myriad of other combinations. This species will hybridize with other yellow Amazons in nature. So the exact feathering and color in the wild as well as in captivity can be quite different in each bird. The immature bird has only a patch of yellow on the forehead with maybe a dappling of yellow across the rest of the head, and less red at the bend of the wing. The completely yellow head of mature birds takes place through molting over a period of about 4 years. In the wild, the diet of the Double Yellow-headed Amazon consists of fruits, plants, seeds and nuts and probably some protein. A pet bird will enjoy a varied diet, including a quality seed mix or a pelleted diet, and many fresh fruits and vegetables. Pellets will work if started at an early age. gets older the entire head and throat will be yellow. very vocal and already seems to be forming words! Plenty of human food that is nutritious can be offered, and they like chicken. They like to eat at the table and enjoy eating with their family. Avocado and chocolate are toxic to any parrot. They will let you know when it's dinner time. A roomy cage is required for the Double Yellow-headed Amazons. Amazon parrot cages must not be too confining, so get one that your pet will be able to feel comfortable in. It is their territory and their safe place.This parrot likes to climb and play, and enjoys expanding its wings. It is recommended that a cage be 2 x 3 feet wide and 2 1/2 to 5 feet high, and with a play pen top. A great thing is to have a hanging perch above that for climbing. Yellow-headed Parrots can tolerate varying temperatures, but they need to be kept away from any drafts. They love to be out of their cage on a playpen, and will enjoy interacting with their human as well as playing with toys. A variety of perches should be used of varying size and texture. A rougher textured perch instead of the smooth, doll-rod types, makes it easier for them to perch and is better for their feet and legs. A concrete perch can be placed as the highest perch in the cage and next to a toy. At times during the day they will perch there and it will save them (and you) from the ordeal of having their nails filed. Learn to have fun during bath time. Whether you spritz your amazon with water or an aloe spritz, or just put him in the kitchen sink, make it fun. Your amazon will teach you how he likes to be bathed. The Yellow Headed Amazon enjoys human interaction as well as interaction with other birds. In the wild they are very social birds living in groups with the available food supply determining the size of the group. Many times there are several hundred seen in a group. They also form permanent pairs when they are sexually mature. However, they are also seen singly in the wild, which may be the reason for their more independent nature. If you are looking for a quiet, shy, timid bird, this amazon is not for you. It is a highly social bird who loves to be the center of attention. They will learn tricks, and learn to play tricks on you. They look forward to interaction and games and will provide you with many fun moments and a lot of laughter. The Double Yellow Headed Amazon quickly becomes accustomed to a new environment and its keeper, and is then ready to start bird training. Generally though, you should give a new arrival a few days to get use to you, your voice and its cage before trying to handle it. A hand fed baby will not need much taming and can often be handled right away, as it is use to human attention. The Yellow-headed Parrot is an active bird and needs plenty of toys, and a hanging perch would be great. A moveable perch that can follow you around the house is almost a requirement. It likes to play, will make its own music and dance, and is quite an acrobat. They entertain themselves quite well and you will enjoy it. Double Yellow Headed Amazons are not sexually dimorphic, females look like males. If gender identification is important (for example for breeding birds) DNA / Feather or surgical sexing is recommended. These Amazons are commonly bred in captivity. They must be mature, 4 - 5 years of age. The sexes must be confirmed and the pair must be harmonious, bonded with each other. They will need a nest box that is 31"-39" (80-100 cm) high with an inside diameter of 12"-14" (30-35 cm) and an opening of 4"-5" (10-12 cm). Provide some soft bedding material inside on the bottom of the box. At the onset of warm weather (April to early May) courtship will begin. The hen will then lay two to five eggs which incubate for about 28 days. The young will leave the nest at 8-9 weeks old. As with many parrots, the male will eat for both himself and the female while she incubates the eggs and feeds the young. The male regurgitates the food for the female to eat. He gets a lot less picky about what he eats at these times. If you notice any of these bird illnesses in your Yellow Headed Amazon, immediately provide a warm, draft free, secure environment kept at about 86°F (30°C). Place food and water close to the perch where it is easily accessible. An ailing parrot should be taken to a avian veterinarian for diagnosis and treatment. The Double Yellow Headed Amazon is readily available and it should be easy to find one in a pet store or from breeders in your area. They can be rather expensive. I have a 26 year old named Nihi (hellow in Japanese) my sons have called him their little green brother ever since I got him. He calls to dogs that we have had through the years, and has been a joy. he has even ordered an Apple compeuter using google home.I got rid of the google home, because Nihi is a part of my family and it is not. Nihi is a trusted friend and a joy in my life. We have flying squirrels/Eastern and Southern Grey/Rock Squirrel for sale. We can arrange transportation for out of state homes via Delta! we encourage personal pickups on appointments only(no exception). Our babies come hand fed, extensively socialized,bonding, healthy and each will come with hand feeding supplies and a sample of food. Hello, I have a pair of African Grey parrots available and I'm giving them out to good and caring homes. Get back to me directly via Call, Text or WhatsApp to (470) 765-8222 for more details. I am giving them out for $350 each and $700 for the pair. Looking for a double yellow head amazon female between ages 5-10.